India has a wealth of cultural, religious and folk festivals which vary from state to state, urban to rural and religious to patriotic. Food has always been a huge and central part of all the traditional festivals. Of course, the fairly recent ‘Food festivals’ are just fun events with some theme or the other, featuring foods from different states within India or international foods. But the foodie in me was thrilled when on a recent visit to Pune, there was a Khau Galli festival. 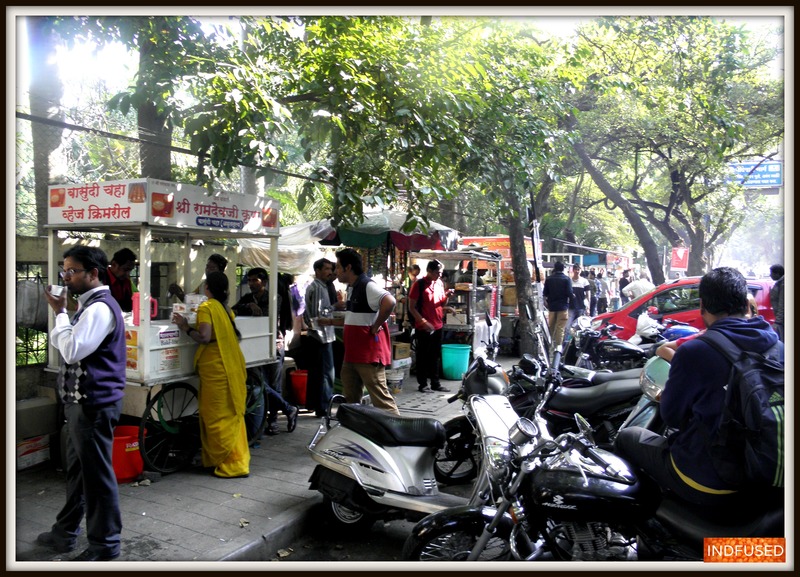 Khau Galli literally translates to a street full of yummy treats.These are streets lined with food carts that serve breakfast, lunch, dinner and all kinds of desserts, mostly at reasonable prices. They are very popular with young and old alike. I want to share a glimpse of the food carts with you. I hope you enjoy them as much as I did. In this two part post let me start with some breakfast foods. Breakfast foods in the morning and Lebanese food in the evening! I got Vada sambar -fried savory doughnut shaped vadas with curried sambar Chutney sandwich pakora in the background! Young coconut water and tender coconut flesh- Yum! my favorite! Do let me know if you would be interested in replicating any of these in your home. I would be happy to share my recipes for them. Enjoy the flavors of the season! Thank you so much Flora! wishing you a great 2015!